You are here: Home / News / Jonny Vegas! 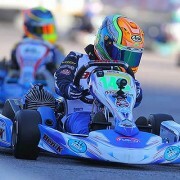 Jonny powered his way to a sensational victory in the Super Nationals, America’s biggest karting event. Held at the Westgate Centre in Las Vegas, this meeting is run over 4 days and attracts Europe’s leading competitors as well as the top stars from America’s two continents. This year the total prize fund amounted to $57,000, around £38,000 in our currency. Jonny was competing in the Cadet class, easily America’s largest category with 83 others also taking part. Three other British drivers had made the trip and all four managed to qualify for Sunday’s main event with 42 karts on the grid. Jonny shared the front row alongside Nick d’Orlando from New York, whom he had narrowly beaten in March to take the Florida Winter Tour title. Joseph Taylor was on row 4 with Wesley Mason and Max Dodds sharing row 7. 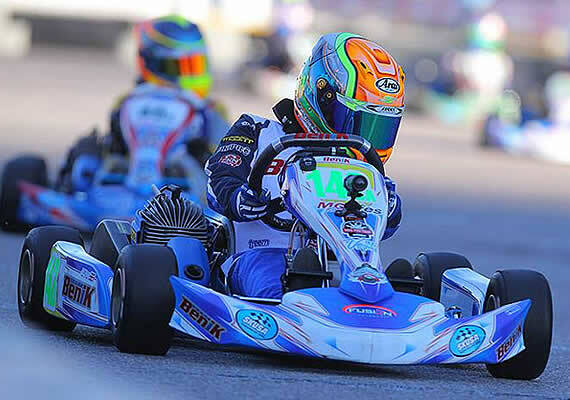 EKN News editor Rob Howden had predicted a win for Jason Welage over d’Orlando, placing Jonny 3rd on his list ahead of Lachlan DeFrancesco and Oliver Calvo. However, both DeFrancesco and Welage had done badly in their Heats and were starting this race fairly well down on the grid. At the start d’Orlando, Sam Mayer and Ryan Schartau got their wheels ahead of Jonny. After a couple of laps had been completed, however, Jonny hit the front, pulling Calvo along with him. Calvo took over the lead soon afterwards and these two steadily moved away from the chasing pack. Just after half distance, Jonny went into 1st place once again, but lost out to Calvo with a couple of laps remaining. On their final tour Calvo left a large gap and Jonny shot through into the lead. As a result, Calvo ran wide, hitting the barriers. His team later protested Jonny’s overtaking manoeuvre, but video evidence proved that neither kart had touched and the overtake was perfectly fair. That gave Jonny a great victory on his final outing of 2015. Tomas Mejia finished some 40 yards further back in 2nd spot ahead of Jak Crawford. D’Orlando was classified 6th behind Anthony Willis and Tyler Maxson. After initially dropping down to 25th spot following a 1st bend collision, Joseph Taylor did very well to eventually finish 14th. Wesley Mason was 23rd, 9 places ahead of Max Dodds. http://www.jonnyedgar.co.uk/wp-content/uploads/2016/02/Jonny_Vegas.jpg 400 570 Admin http://www.jonnyedgar.co.uk/wp-content/uploads/2016/02/Logo_340x180_Colour-300x159.jpg Admin2015-11-22 16:15:172016-03-22 13:41:40Jonny Vegas!